An evaluation of a similar unit in Damascus, Syria where the initial development work was undertaken, showed a total cost of $14.00 U.S. ($12.75 per square meter) as compared with about $21.00 U.S. ($19.00 per square mter) for Barbados. In each case the labour costs were identical. However more of the materials required are manufactured locally in Syria resulting in a lower materials cost. Experiences in India and Africa show that this type of dryer can be constructed for approximately the same price. The amount of annual maintenance on the dryer is small, consisting moLnly of keeping the transparent covers and interior of the cabinet clean. The unit could perhaps be repainted annually; however, this is not expensive, in humid tropical climates, assume the total life of a plastic covered unit as 5 years. This represents an operating cost of $5.50 (U.S.) per square meter of drying area. Again when contrasted with a similar study in Syria, the operating cost there was about $2.75 (U.S.) per square meter, if a glass cover were to be used,a longer life duration might be expected, in general, it has been found that this type of dryer results in an average production cost increase of 3%. In some cases it is preferable to have a plastic cover rather than a glass cover, to prevent breakage by flying stones, etc. However, the glass would normally have a longer life so that, in the final analysis, the farmer himself must decide which is the more economical and acceptable for him. Presumably if the dryer was placed on a building roof, the glass might last 10 to 20 years without breakage. With regard to labour costs, it must be stressed that all the construction to be undertaken is quite simple and could be performed easily by the farmer himself using simple hand tools. This would reduce the financial outlay of the farmer by about 25%. A very practical auxiliary application of the dryer is for warming foods and other materials. It is particularly advantageous as a self-contained source of heat at 70-80 degrees centigrade in the field and in isolated farm areas. 1) Lawand, T.A. 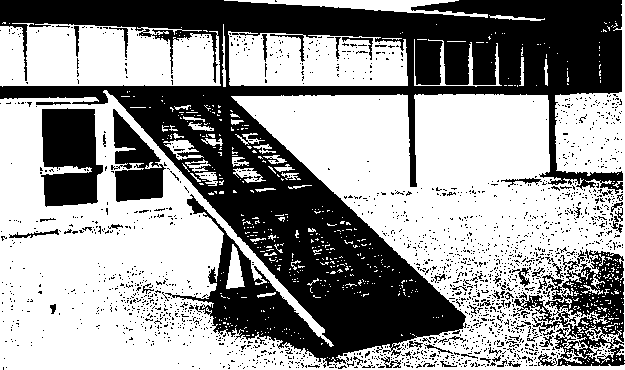 A Solar Cabinet Dryer, Solar Energy, vol. 10, No. 4, pp. 158-164, October 1966. Figure 1. First Position of the Drier at 30°. 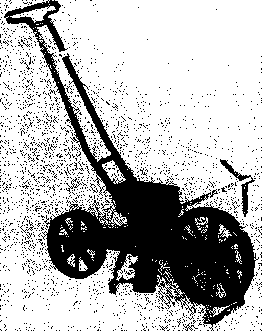 Position initiale du Séchoir - 30°. Only tested on an experimental basis to date. The quantity of cocoa that can be handled depends mainly on the climatic conditions at the time of loading. With strong sunshine and low humidity, about 45 Kg of fermented cocoa per square meter of effective surface can be loaded. If the climatic conditions are unfavourable, (high humidity, low solar intensity), the cocoa load should not exceed 20 to 25 Kg/m2 of useful surface. Compared with natural and sun drying techniques, the drying time can be reduced by two days when the climatic conditions are unfavourable. On the other hand, in a climate favourable to drying, this difference is less important. The water content of cocoa at the end of the drying period is within 7 to 8% (wet basis) which is impossible to reach with other methods. It is absolutely essential to stir the cocoa at least once a day. For practical operation, the thickness of the cocoa layer should not exceed half the depth of the dryer. Cost of Materials: wood for frame 5,.35 $U.S. These are estimated costs to which must be added labour cost. 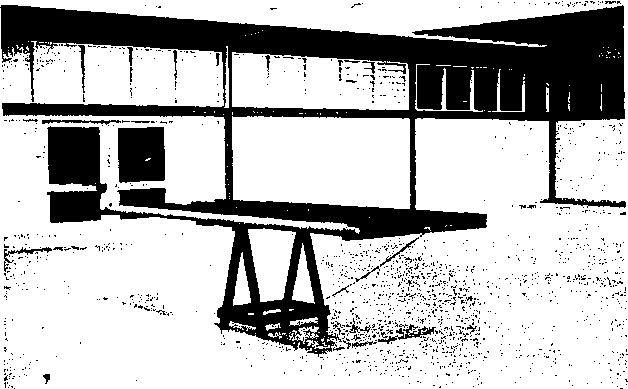 An estimate of the construction costs of a see-saw dryer of the dimensions included in the attached set of plans was prepared in Ghana in 1970 and gave a total price of about $18,00 U.S., including work. An Ivory Coast cocoa plantation produces about 1000 Kg of cocoa per hectare per season. This production is harvested in many collecting operations made every 2 weeks, the largest of which can yield 200 Kg of fermented cocoa at 50% moisture content (wet basis), ready for the drying operation. Assuming a total price of $18,00 for each unit, then the investment amounts to $72 00 divided by 1000 Kg of freshly harvested cocoa; that is 7,2 cents per Kg. As the unit life expectancy is about 3 years, it would appear reasonable to assess yearly redemption of less than 3 cents per Kg of fresh cocoa. It has some technical problems such as condensation of water vapour in regions where temperature variations are high, and low resistance of P.V.C. cover. In some regions, where the income level of the local population is very low, the price of the dryer might prove to be limiting, if the dryer can be easily made of materials almost entirely available to the local inhabitants, then the dryer seems quite appropriate, in particular r«* the drying of material needing stirring. Figure 3. 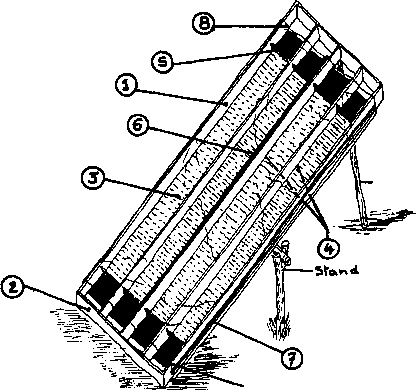 Variation of the See-Saw Dryer showing its main components.